Disney•Pixar's Incredibles 2, the sequel to 2004's beloved Oscar®-winning The Incredibles, received a mega-strong reaction from critics and audiences — earning a 93 percent critics rating on Rotten Tomatoes, rocketing atop the list of highest-grossing animated films, and surpassing $1 billion at the global box office. Fans can reunite with this incredible family of Supers instantly on Digital in HD and 4K Ultra HD™ on Oct. 23, and on Blu-ray 4K Ultra HD,™ Blu-ray,™ DVD and On-Demand on Nov. 6. 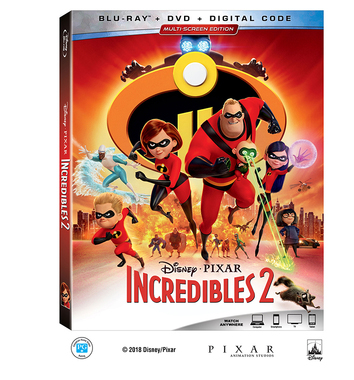 Family members of all ages will be hypnotized by hours of delightful entertainment, with never-before-seen Incredibles 2 bonus material featuring an all-new mini-movie starring Edna Mode, alternate scenes, never-before-revealed details about the making of the film, featurettes highlighting Pixar’s genius artists, and much, much more. Available now on Digital and on Blu-Ray. 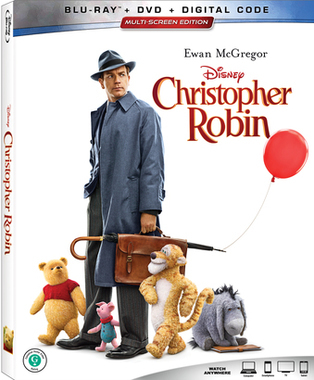 Disney's "Christopher Robin," the wondrous, live-action film in which Winnie the Pooh and friends venture into mid-century London to help grown-up Christopher Robin (Ewan McGregor), arrives instantly on Digital and on Blu-ray™ and DVD with captivating, behind-the-scenes extras. The fun-filled tale features A.A. Milne’s timeless characters from the Hundred Acre Wood — Pooh, Tigger, Piglet, Eeyore, Kanga, Roo, Rabbit and Owl — making their first appearance as three-dimensional characters who remind Christopher Robin, and viewers of all ages, to appreciate the simple pleasures in life. This entirely new take on the Winnie the Pooh stories will transport parents back to the imaginative, carefree days of childhood and allow them to share their love of Pooh and friends with their own children. “When you are able to make people laugh and cry in the same movie and you are able to tell the story with integrity and ground it in reality and have the magic realism on top of it, it lifts your spirits and connects you with the people you love,” says director Marc Forster. "We could all use a little bit of Pooh’s heart and wisdom right now." Bonus features provide a heartfelt look at the making of "Christopher Robin," showcasing the magical artistry that brings the classic characters to life, the human actors' techniques for interacting with stuffed animals, and the filmmakers' passion for their project. Bronte Carmichael, who plays Christopher Robin's daughter Madeline, takes viewers on an exciting journey from the drawing board to film locations throughout the United Kingdom. Features flash back to highlight Walt Disney's fondness for Winnie the Pooh and recall the voice actors who lovingly portrayed the unforgettable voice of the iconic character. An exclusive digital bonus feature explores the actual teddy bear, given to Christopher Robin Milne 98 years ago, which inspired the original Pooh stories that have been shared and adored by families around the globe. 2018-11-18 [有片] Lemon slices 切片檸檬成細菌溫床 暗藏危機 !